In business, sometimes you need to take a step back to take a step forward. For many companies this means re-evaluating their entire operations and looking at their company through the eyes of an outsider, experts say. Often, entrepreneurs get too caught up in the daily minutiae to see the bigger picture. But it’s never too late to find new growth opportunities, provided you’re willing to get outside your comfort zone. “We all fear change, and it’s easier just not to change,” says Jerry Siegel, president of JASB Management, a business man¬agement training and develop¬ment firm in Syosset. But business as usual doesn’t cut it in this slow economy. You need to continually look for new ways to improve your people, operations and overall attitude. 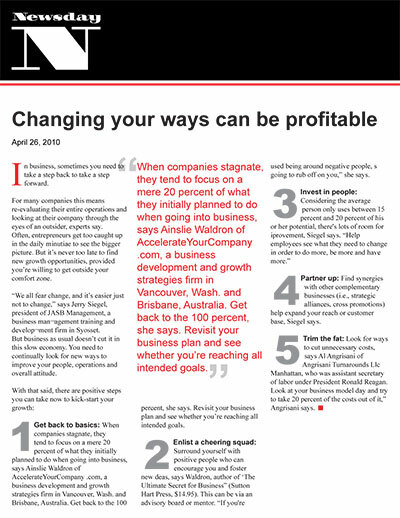 Get back to basics: When companies stagnate, they tend to focus on a mere 20 percent of what they initially planned to do when going into business, says Ainslie Waldron of AccelerateYourCompany .com, a business development and growth strategies firm in Vancouver, Wash. and Brisbane, Australia. Get back to the 100 percent, she says. Revisit your business plan and see whether you’re reaching all intended goals. Enlist a cheering squad: Surround yourself with positive people who can encourage you and foster new deas, says Waldron, author of ‘The Ultimate Secret for Business” (Sutton Hart Press, $14.95). This can be via an advisory board or mentor. “If you're used being around negative people, s going to rub off on you,” she says. Partner up: Find synergies with other complementary businesses (i.e., strategic alliances, cross promotions) help expand your reach or customer base, Siegel says. Trim the fat: Look for ways to cut unnecessary costs, says Al Angrisani of Angrisani Turnarounds Llc Manhattan, who was assistant secretary of labor under President Ronald Reagan. Look at your business model day and try to take 20 percent of the costs out of it,” Angrisani says.